When as kids we noisily chased each other around, our parents accused us of being “squirrely.” You needn’t look far for the origin of this expression. Take a camping trip in the next couple of months, and you’ll see campground squirrels chasing each other around tree trunks, across campsites, and up and over picnic tables. What looks like a loosely organized game of tag where nobody knows who’s “it” is actually a part of squirrel breeding behavior. In fairly moderate climates, gray squirrels mate twice: first in midwinter, and then again in early summer. And they don’t do it in privacy. Female squirrels exude a scent that is readily identifiable to males some distance away. And they come running. It’s common to see two or three males, but an especially alluring female may attract an entourage of up to a dozen. They spiral up trees in hot pursuit of the female, launch themselves from an improbable perch onto an impossible twig, and hang on only long enough to make another thrust into the air, chattering and squealing throughout the entire episode. After the novelty wears off, the youngest and oldest males gradually leave the field to the most frenetic. Even so, by the time the female is ready to accept a partner, the winners are nearly too tired to claim the prize. Within a day or two of first mating, the pair is ready to split up anyhow; the male returns to his bachelor existence, and the female sets up housekeeping. Squirrels build leafy nests when necessary, but they seem to prefer cavities in trees. Woodpecker nest holes attract them, even if there is no vacancy at the moment. After enduring several days of constant nagging, the disheartened woodpecker may fly off in search of more peaceful surroundings. In minutes, the squirrel moves in. Fleas, lice, and other parasites move in also, and they can be a terrible problem for squirrels. A female with young may build a half-dozen nests in her feeding territory. That way, if the vermin become too numerous in one nest, the squirrel can move her growing family into less infested quarters. In a little more than 40 days, the female squirrel will bear three to five furless, helpless, one-ounce babies. As they grow, she brings them a variety of foods – nuts, berries, campground tidbits, birdseed, insects – even perhaps a baby bird, if she’s crafty enough to snare it. Before long, the youngsters emerge from the nest to begin exploring on their own. 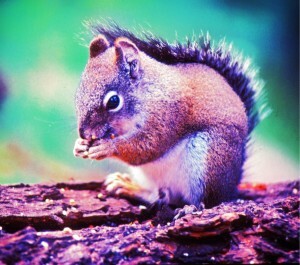 Squirrels are among the most industrious of animals. They must be pessimists by nature, because each autumn they literally exhaust themselves as they store every edible they can find. People have long wondered whether a squirrel remembers where it hides all those hundreds of seeds. A scientist turned the question into a research project and found that the answer is no. Once a squirrel buries an acorn, it forgets about it. Later, it locates buried treasure by snuffing around in the snow or leaf pile until its nose zeros in on something. A squirrel can smell food under a foot of snow or leafy covering. The squirrel maintains a loose feeding territory, but some areas of overlap exist – spots where one rodent can bury a seed and another can happen by later and eat it. Some seeds escape notice, of course. Ernest Thompson Seton claimed that most of the forests that once covered much of North America were actually planted by gray squirrels. Watching a squirrel navigate through the trees can be entertainment enough for an afternoon. A squirrel’s tail is a marvel of engineering. It serves as a rudder, a counterbalance, and even a parasol. On occasion we’ve noticed a squirrel running parallel to our hiking path. It seemed to be keeping us company as it dashed through the trees as fast as we could walk along an open trail. At night, that same tail plays a part in sleeping arrangements. It serves equally well as a pillow or as a coverlet, depending upon the season. And although sometimes it may be difficult to believe that squirrels slow down long enough to go to sleep, they do. They need some rest to prepare for the next day’s activities. Even though we might enjoy watching their sense of play and lightheartedness, a person wouldn’t actually want to be a squirrel – at least not to live on a diet of pine nuts, insects, and acorns. But it certainly would be nice to have their energy level. ANY purchase through this link helps support Our Window on Nature.